This year is the centenary year for International Women’s Day. 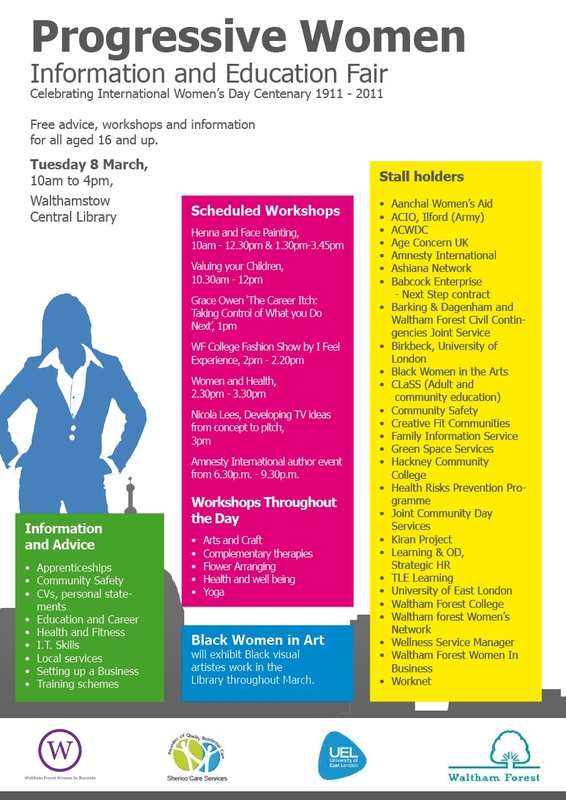 To mark the day, the ‘Progressive Women: Information and Education Fair’ is being held at Walthamstow Central Library on Tuesday 8 March. 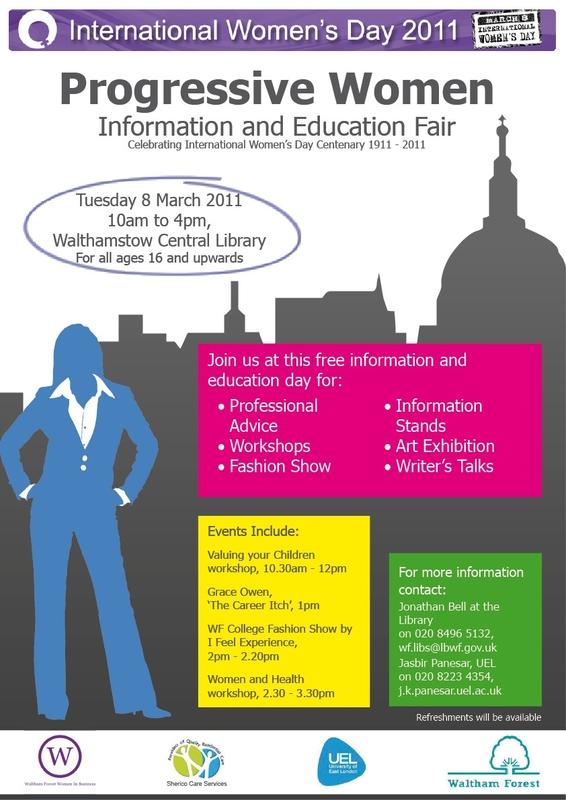 The fair runs from 10am until 4pm and there are a range of events, workshops, information stands and talks on the day. Various charities and support organisations will have stalls and there are workshops on everything from writing good CVs to yoga. A full listing on what is available on the day can be found on the flyers to the left. The 3pm talk is by Nicola Lees and is called ‘Developing TV ideas from concept to pitch’. Nicola is the author of ‘Greenlit: Developing factual/reality TV ideas from concept to pitch’ and she will be sharing her insights and experience of 13 years working in TV. Sources for more information are listed on the flyers. If you click on the flyers, they should pop up nice and big so you can read them! The Stow’s Vintage Lifestyle Fair takes place this Sunday, with a Valentine’s theme. The ‘Valentine’s Fancies’ event is in the ballroom of the Orford House Social Club in Walthamstow Village. The fair promises to be a veritable smörgåsbord of vintage. Clothes, jewellery, hats and accessories are on offer, along with rare vinyl, books and crafts. There is also music, and a tombola if you’re feeling lucky. The fair runs from 12-5pm so will make for a marvellous Sunday afternoon. You could even head to the Castle or the Nags Head nearby for a swift one, perhaps to revel in a glorious tombola victory? Anyway, tickets are £2 on the door, under 16s get in free. Have fun!